The staggering beauty of this beach is hard to put in words. 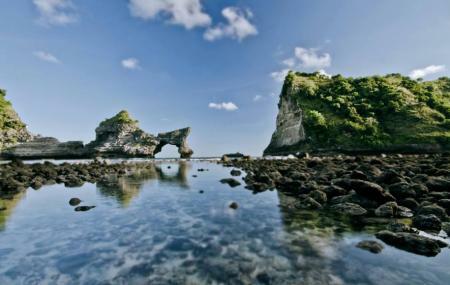 Isolated in a remote eastern corner of Nusa Penida, it is surrounded by rocky cliffs shrouded with verdant green foliage. The water is a sapphire blue. The striking formations of the rocks that flank the beach and crop out of the sea give it an otherworldly feeling. The coral reefs are stunning at low tide. The beach is entirely undeveloped, so you will have to bring all of your own gear if you want to snorkel. This includes food and water. If you’re coming early or heading back late, you’ll have to bring some powerful headlamps or flashlights. You can camp here overnight if you wish. Drive to here on motorcycle. The access road is rough. Get to the parking area. How popular is Atuh Beach? People normally club together Angel's Billabong and Atuh Raja Lima Nusa Penida while planning their visit to Atuh Beach. People also prefer to end their day with Atuh Beach. Beautiful beach cove between cliffs on east and west side. Lots of little shops (warungs) at the beach for hot food and cold drink. West side access has concrete stairs down to the beach (pay to enter 5k rupiah pp). The east side has a nice view but there are no stairs down to the beach. Just a rugged path we did not attempt. The drive time between east and west points is~25min by scooter or car. Great beach. Was amazing. Very relaxing, not many beaches like this. Highly recommend visiting but only if you can tolerate a very steep walk down and then back up the hill. No shade and alot of steep steps. Not suitable for anyone with physical disability or who isn't used to fitness. Was exhausting for me to go down and up in this heat. Is very rewarding when you make it. Great for swimming. There is a small charge to enter beach and they charge to use the toilet. The toilet is horrible. Very old and very dirty. I recommend only using the toilet here if you really really need to. Gorgeous beach and decent facilities/bars/restaurants. Not a 5 star because it’s quite Rocky and the waves are strong. You should check the tide and come when it’s high tide otherwise you won’t be able to swim. Parking at Diamond beach and climbing down the stairs will enable you to see both beaches. The roads are quite bad so be careful! Great! Getting there and leaving it are quite the workout but worth it. The views from the top and the beach itself are stunning. There are several warungs located on the beach, so plenty of time to relax. The sea is quite rocky, not ideal for swimming.